Throughout October, across the river in Cambridge, Harvard University dining hall workers went on strike. The workers walked out in protest over low wages and proposed changes to their health care plan that would increase out-of-pocket costs. The strike just ended last week, with the workers having their wages increased to $35,000 a year and additional compensation during summer months, with changes to their healthcare plans dialed back. You might wonder why this matters to any of us. After all, we don’t go to Harvard. But I think the dining hall workers strike at Harvard is worth thinking about, even for us at Boston University. Universities rely on labor to function. This is a fact. But it’s also a fact that some types of labor are more noticeable than others. It’s easy to see the work a professor does, because a professor stands in front of his students and teaches. It’s easy to see what Dean Kenneth Elmore does because he manages to show up and be his groovy self at almost all events with consistency. But it’s hard to see the labor that’s often most important for basic functions. I’m talking about the dining hall workers, but I’m also talking about the cleaning staff, security guards and maintenance staff. All of these staff members ensure that the university runs smoothly, yet we hardly ever think of them or what they do. We actively try to ignore it, in fact. I’ve seen many people try not to make eye contact with the men and women cleaning the bathroom floors, and I’ve seen many people not say “please” or “thank you” when they’re being served at the dining hall. I’ll admit that I’m not perfect either. I’ve been guilty of both, and this carelessness devalues and disrespects the important work these people do. These workers ensure that the world we live in runs smoothly, with its wheels greased and constantly spinning. To not acknowledge this is to make the work they do invisible, despite relying on their labor each and everyday. 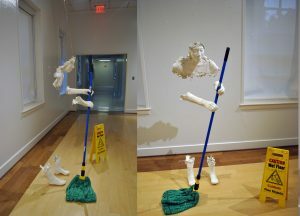 The invisibility of labor was actually the theme of my friend Kayla Reische’s sculpture that she made in high school. Kayla Reische’s plaster sculpture omits parts of a woman’s body to visualize the invisibility of labor. PHOTO COURTESY KAYLA REISCHE. Reische used pale white plaster to create a life-size sculpture of a woman with a mop in one hand and a bucket nearby. Interestingly, only her feet, hands and head were visible, suspended from the ceiling with translucent wire. The rest of her body was left invisible. When I asked her about the piece, Reische explained that she did it to make a point about the invisibility of labor. This was a woman who, if alive and breathing in a gallery, very few people would acknowledge. Her aim, by putting a reconstruction of this invisible woman in a gallery, was to make this woman the center of attention. Her message: the invisible should be made rightfully visible. In that vein, we should make the invisible labor of these workers painfully seen. In essence, when you look at what’s around you — the emptied trashcan, the shine on the floor, the drain that’s free from hair clusters — ask yourself, “How did this happen?” Chances are someone did that for you, and they live regular lives just as you do. I was in Harvard Square last weekend before the strike ended and I saw dining hall workers and supporters marching through the square. They were singing, chanting and playing music. But as they marched by, the joy and hope inherent in their collective forward movement was evident. It’s these people who keep our universities running smoothly. You don’t have to march with Harvard’s dining hall workers to spread this message. Instead, you can toss your paper towels in the trashcan, bus your plates and if you drop something on the floor, pick it up. If you don’t, someone else will do it in your place, with no thank you’s or payment expected. This selflessness comes from our own selfishness, and it’s time to pay our debts.